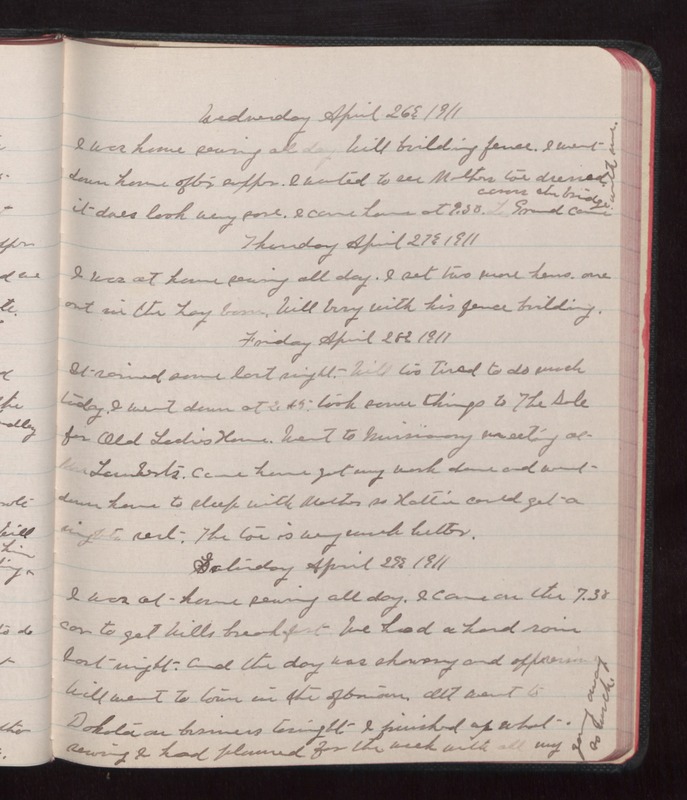 Wednesday April 26 1911 I was home sewing all day Will building fence. I went down home after supper. I wanted to see Mothers toe dressed. It does look very sore. I came home at 9.30. Le Grand came across the bridge with me. Thursday April 27 1911 I was at home sewing all day. I set two more hens, one out in the hay bard. Will busy with his fence building. Friday April 28 1911 It rained some last night. Will too tired to go much today. I went down at 2.15. Took some things to The Sale for Old Ladies Home. Went to Missionary meeting at Mrs. Lamberts. Came home got my work down and went down home to sleep with Mother so Hattie could get a nights rest. The toe is very much better. Saturday April 29 1911 I was at home sewing all day. I came on the 7.30 car to get Wills breakfast We had a hard rain last night and the day was showery and oppressive Will went to town in the afternoon. Ott went to Dakota on business tonight. I finished up what sewing I had planned for the week with all my going away so much.